A strong foundation in reservoir rock and fluid properties is the backbone of almost all the activities in the petroleum industry. Suitable for undergraduate students in petroleum engineering, Petroleum Reservoir Rock and Fluid Properties, Second Edition offers a well-balanced, in-depth treatment of the fundamental concepts and practical aspects that encompass this vast discipline. Accessible to anyone with an engineering background, the text reveals the importance of understanding rock and fluid properties in petroleum engineering. Key literature references, mathematical expressions, and laboratory measurement techniques illustrate the correlations and influence between the various properties. Explaining how to acquire accurate and reliable data, the author describes coring and fluid sampling methods, issues related to handling samples for core analyses, and PVT studies. He also highlights core and phase behavior analysis using laboratory tests and calculations to elucidate a wide range of properties. Abhijit Y. Dandekar is a professor of petroleum engineering at the University of Alaska Fairbanks. An active member of SPE, Dr. Dandekar is the author or coauthor of over 30 peer-reviewed technical papers, over 45 technical conference papers, and numerous research reports in areas as diverse as special core analysis, PVT and phase behavior, gas-to-liquids, gas hydrates, viscous oils, wettability alteration, and CO2 sequestration. He received his PhD in petroleum engineering from Heriot-Watt University. I adopted Petroleum Reservoir Rock and Fluid Properties for my course a few years back, and I still believe it is a good compromise between topic coverage and depth. 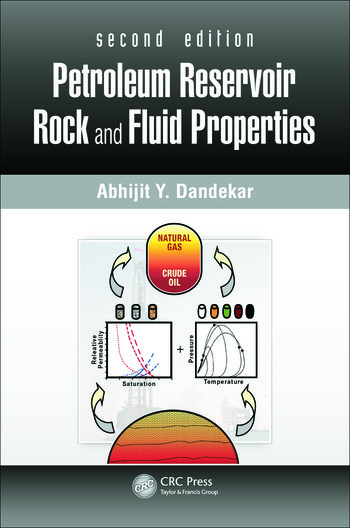 … This book is an excellent gateway for engineers and scientists in training to understand fundamental petroleum reservoir rock and fluid properties. Prof. Dandekar presents a broad collection of topics, practice problems, and measurements techniques aimed to acquaint students with classic concepts, as well as traditional and modern measurement techniques. The author has provided very detailed information based on his extensive hands-on experience. Easy to read and understand, like sitting in his lectures. Starting from basic and easy materials and gradually moving to more difficult and applied concepts. Plenty of examples and case studies. The other point of strength is that the author covers both rock and fluid aspects in petroleum engineering. This is not only very useful for people who are interested in both topics, but also for people who are interested in only rock or fluid aspects, as they can go over the other aspect which gives them plenty of useful/relevant information which will enrich their understanding and/or lectures. A very good book suitable for both students and lecturers with plenty of worked examples and problems. Good continuity, easy to understand for an undergraduate student. Well illustrated and can also be used as a reference for practical work. … Material is well organized. The book may be appropriate as a textbook for a course like properties of rocks. An absolutely first-class piece of writing … a very full and solid work that is bound to stand as a reliable textbook for students and an essential reference for engineers. … of inestimable value to the target audience ... enormously valuable ... as an immediate on-the-spot reference to those already well immersed in the field. … No one writing about this subject for students in the future will be able to ignore this graceful and probing book so imaginatively organized.